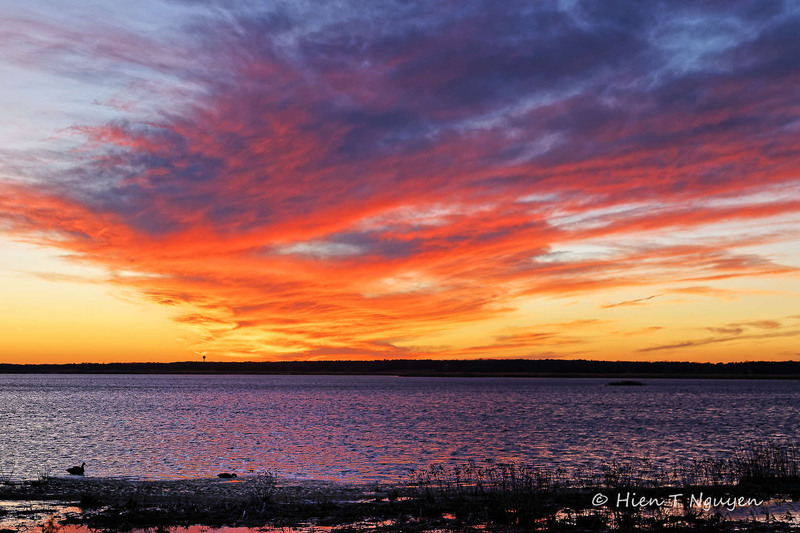 The shot below is of the most colorful sunset I ever saw at the Edwin B Forsythe National Wildlife Refuge. Sunset at EBF, January 2015. Stunning cloud formations beautifully lit by the dawn’s first light!The vastness of the waterscape underneath immensely sets off its beauty,Hien! Glad you like this photo, Doda! Nature beauty is there to contemplate, or photograph, but many times I find myself the only one to stop and take the shot. Can’t believe that people stay apathetic in front of these scenes,where one sees the grandeur of nature. That is something to behold! Gorgeous! Thank you Judy! I was surprised so many cars, almost all of them, just drove by and didn’t stop to look at that gorgeous sunset. Nice job on catching the water reflection. Such a stunning collage of color Hein. Gorgeous capture. Another excellent image, and you’re so lucky to have saved the moment forever in your photo! Thank you Jerry! Maybe I’ll try printing it too. Beautiful. That must have been exquisite to experience. Thanks Katelon! This one made up for all the sunsets I waited for which turned out just so so. The sky was changing by the minute, and after the sun went below the horizon all these nice colors appeared. Thank you for commenting!